Small caps kept the ball rolling in the stock market this week. Without the decent showing in the Russell 2000 we wouldn't have seen the continued improvement in the stock market statistics we track below. Major averages stagnant but gains in the broader market? That's OK, I'll take what I can get. Our technical analysis of the market follows. We now have four weeks in a row where the short-term moving averages have been climbing. The number of stocks above their 20-day moving average increased again but the rate of increase is slower than the previous week's. We're just about at the point where half of al stocks we track are above their 2-day MA. The number of stocks above their 50-day moving average moved up and has reached a level of a 2625, just above one third of all stocks. This metric is moving steadily upward. Finally, we see that the number of stocks whose 20-day moving average is above their 50-day moving average has increased two week's in a row and is now ever so slightly above the reading we got at the March low. The Aroon analysis we do shows stocks in strong up-trends or down-trends. This week's chart shows the number of stocks found to be in strong up-trends has increased again and has hit a level of 1900. Though better than the level at the March low, it is still only about 26% of all stocks we track. The number of stocks determined to be in a strong down-trend has fallen to 1320. This is about 18% of all stocks. Based on Aroon analysis, then, if 26% of stocks are in up-trends and 18% of stocks are in down-trends, this implies that 56% of stocks must still be stuck in non-trending price patterns. We also plot the results of Chaikin Money Flow analysis. This indicator is moving steadily in a bullish direction. The number of stocks undergoing strong accumulation or buying has now moved up to 862. Not shown on the chart is the number of stocks shown to be undergoing strong distribution or selling. This indicator has fallen for the fourth week in a row and is now at 349, the lowest reading we have registered since we began collecting Chaikin data back in March. The daily data paints a picture of a market that is decidely bullish though beginning to exhibit characteristics of being over-bought. The weekly data is not nearly so exuberant. We see that the number of stocks trading above their 20-week moving average is moving up. Likewise, the number of stocks trading above their 50-week moving average is moving up. We continue to see a drop, however, in the number of stocks whose 20-week MA is above their 50-week MA. Aroon analysis shows a mixed picture. The number of stocks in strong down-trends based on weekly data is falling but the number of stocks in strong up-trends is also falling. Chaikin Money Flow shows very slow but steady progress in a bullish direction. The following chart of the S&P 500 shows how, despite continued improvement in the broad market, large caps making up this index have stalled out, failing to breach overhead resistance in the 1275 range. The average continues to trade well below the 50-day moving average. As we discussed last week, the 50-day MA is still pointing downward and increasing its distance below the 200-day MA which is also pointing down. Even a strong showing by financials couldn't lift the average much this week. The following chart of the Russell 2000 shows that small-caps are where the action is. The good news is that this average has managed to hang in above its 50-day moving average. 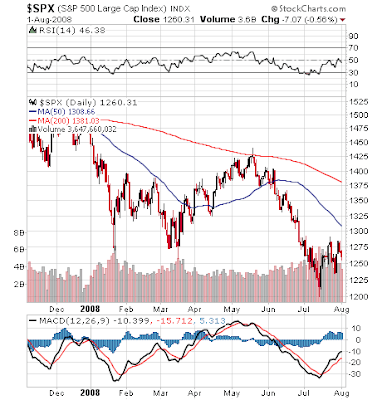 The bad news is that it hasn't been able to challenge its 200-day moving average. The further bad news is that both moving averages continue to point downward though neither is heading downhill as steeply as the moving averages of the S&P 500. With the Russell 2000, we appear to be nearing an inflection point. A failure to get above that 200-day MA could send the average into another down leg. At this point, the markets are struggling to make progress. Promising rallies in the major averages seem to last only a few days. Still, as our market statistics based on daily data show, the broad stock market has managed to eke out some further gains this week. The question is, can the gains continue? From a fundamental point of view, it is clear that the U.S. economy continues to expand albeit very slowly. There are still headwinds in the form of a weakening jobs picture, stubborn inflation despite falling oil prices, potential timebombs still lurking within the financial sector, a housing market still in disarray and an auto industry that is a mess. With this kind of environment, there are individual stocks that can out-perform while we might see major averages struggle. 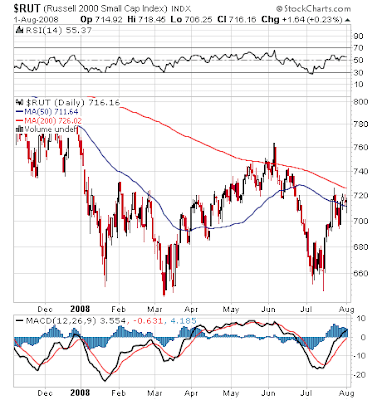 From a technical point of view, stocks in general are still moving up; however, there are the challenges of being over-bought as well as various kinds of overhead resistance in the form of previous bottoms or important moving averages. Failure to sweep these obstacles aside could easily tip stocks to the downside again. For now I remain cautiously optimistic while keeping a couple of ultra short ETFs in the portfolio just in case.